The geographical dispersion of the modern workforce is demanding real-time collaboration through unified communication solutions such as Cisco®Unified Communications (including CiscoUnified Communications Manager and Cisco Jabber), Microsoft Lync (formerly Microsoft Office Communicator) and Citrix GoToMeeting with HDFaces. These solutions enhance productivity and effectiveness by allowing employees in different physical locations to communicate through face-to-face conversations over live video conferencing, audio chat and instant messaging. By combining the mobility and flexibility of desktop and application virtualization available from Citrix XenDesktop with the communication and collaboration abilities of popular unified communication solutions, organizations can create a dynamic virtual workspace that makes it simple to work anywhere, with anyone. 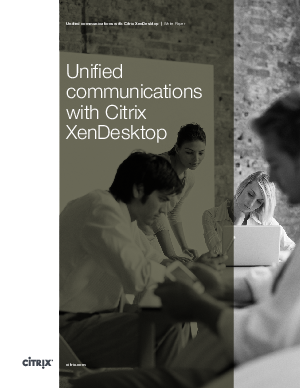 Download this white paper to learn more about unified communications with Citrix XenDesktop.